Over the last month or so, Nokia’s share tumbles are in excess of 27% from a peak of $3.02 to $2.20 as of today. Even while the Windows7.5 powered Lumis is not in the same breadth as Galaxy SIII or HTC One or iPhone, the Lumia dished out some hope to Nokia in terms of survival in the smartphone space. Now with Windows8 working on a completely different kernel compared to Windows 7.5, Microsoft has essentially killed all the Windows7.5 smartphone sales, as retailers and operators will put off their next Windowss Phone purchase till such time when Windows8 smartphones are launched. 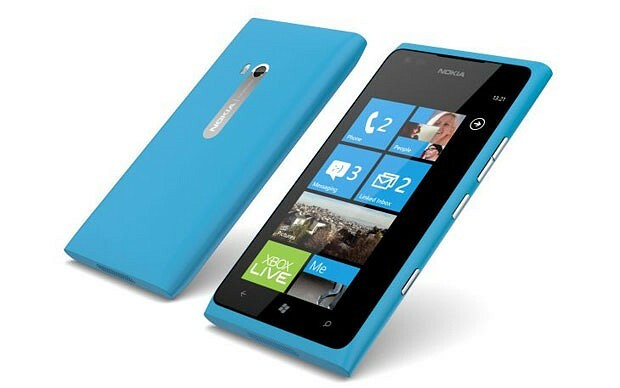 Windows8 will run on Nokia, Samsung, HTC and Huawei. While others may still take things in stride, Nokia which has run a “Windows Only” strategy has the most to lose. Already in its death spiral, Nokia is rapidly running out of time, cash, options and sales. And the overt dependence on Windows has left them high and dry with no options to fall back upon. I am not sure, but Nokia’s dumping of Meego (given its brilliant acceptance) will be haunting Stephen Elop. For all that Nokia has risked in the last year and half, Microsoft hasnot really given Nokia any great hope in terms of Windows on Nokia being a differentiated offering (vis-à-vis Samsung, HTC and Huawei). A stark contrast in this comparison is Samsung which has stakes across Android, Windows, Bada and Tizen as well. Nokia may have to bleed profits to sell off the Lumias in the channel and markets. With depleting cash reserves, a smartphone line-up which is not as invigorating, a junk rating for its credit rating, a double cut (in 6 months) on earnings guidance, Nokia’s H2, 2012 will be the worst double quarter on record. Given the current strength of the Samsungs and Apples around, it is unlikely, that Nokia will recover any lost glory 2013-14. For Nokia, it’s a Hobson’s choice- Death by thousand cuts or a sell off. A sell-off could still make money for Nokia even now. Why Samsung’s Device strategy will not be a sustainable one in the long hop? In fact, Samsung’s superiority in this space stems from its competency across screens – LCD, LED,OLED, AMOLED, Flexible OLED, Super AMOLED. It essentially leverages its strength in TVs to the mobile screen. True the Galaxy S series phones are possibly the first super phones, but is Samsung missing the consumer and the usage bit? Sample this – Samsung has an astonishing range of devices from 1.4” screens to 11” screens. In Tablets, Samsung has 7”, 7.7”, 8.9” and 10.1” screens for Android and will soon come out with a 11” screen for Windows8. The many screen tablet strategy serves to only confuse the consumer in lieu of greater choice. Most importantly, there is no underlying proposition that Samsung over-archingly provides across its high end devices except perhaps a large screen migration from one device to other. Apple on the other hand has 2 devices each in smartphones and tablets and while it competes on the hardware, it also leverages the app eco-system, the voice recognition technology, the iCloud, iTunes store and a seamless transition (between iPad, iPhone, iTV, iTunes) to build the customer story. That to me is a base which can be used to Apple’s advantage in providing a consistently great experience across all screens and keep building on it. Samsung’s range is made of individually great devices, but no commonality underneath the surface. Samsung is also on divided stakes on Android, Windows8, Bada OS and Intel powered Tizen. That is good in as far as de-risking perspective. However, Samsung is being dependent on atleast 3 app eco-systems which is a challenge as far as a consistent consumer experience is concerned on Samsung per se. Samsung would obviously ride on the Android/Windows cloud and the other properties of diverse platforms but there is no singular property which would provide the consistent Samsung experience across the range of devices (Smartphones, Tablets, Laptops, TVs). Compare this with Apple where the iCloud and the iOS form the bedrock of a great consumer experience. While I personally fancy the 5 inch Galaxy Note for the handwriting feature, what amuses me is that Samsung has not really taken this feature across its other smartphones and tablets. As the device space becomes increasingly competitive – (remember how HTC One is snapping at Samsung’s edge), the above mentioned factors provide donot quite provide a platform for Samsung for an all encompassing media and mobility experience. Stickiness and great experience are key to building profitability and that is one area where Samsung shall always lag Apple – in terms of generating profits inspite of a great portfolio of devices. Even while Sony is itself bleeding from a thousand cuts, it has a few interesting properties around media and entertainment (Sony Entertainment, Sony BMG, Playstation). Amazon has a firm media selling competency in terms of books, videos, music. Apple is the best itegrator of online and mobility experiences. These are larger customer propositions than just the device. Samsung rides on the device strengths which are at best competitive but not compelling. Microsoft was a company of the past with its vice grip on PC shipments and from the new spate of devices that Microsoft is getting around it is the company of the future. Steve Ballmer missed a few steps on the “present” but Microsoft now seems to be making a successful transition from its legacy laden desktop centric past to its “converged” future in time. 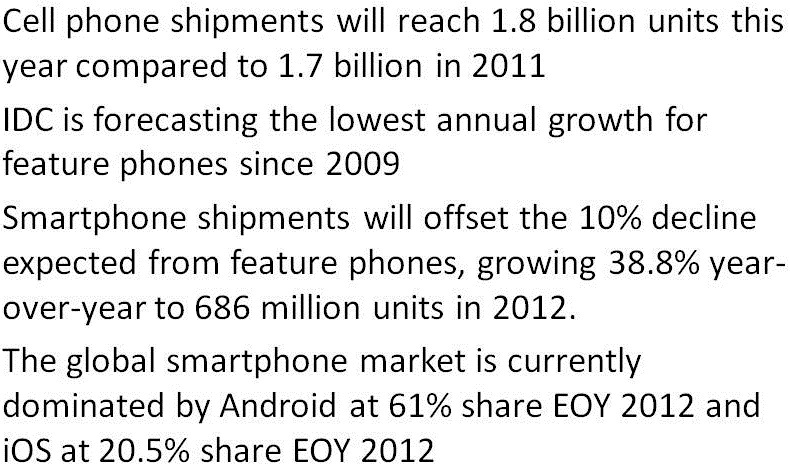 Its inaction in the present meant that it lost the title of the No.1 selling OS on computing devices to Android. Between the technology Triumverate, Microsoft was third in smartphones and until yesterday lagging Android and iOS by a few generations both in smartphones and tablets. 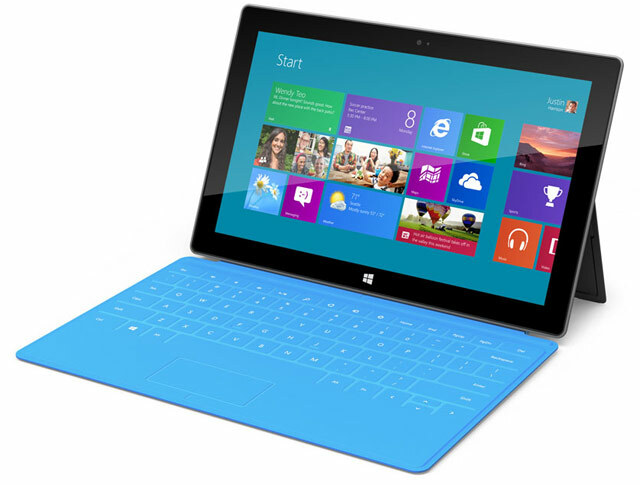 However, the Surface announcement yesterday finally heralds the arrival of Microsoft in the tablet territory. 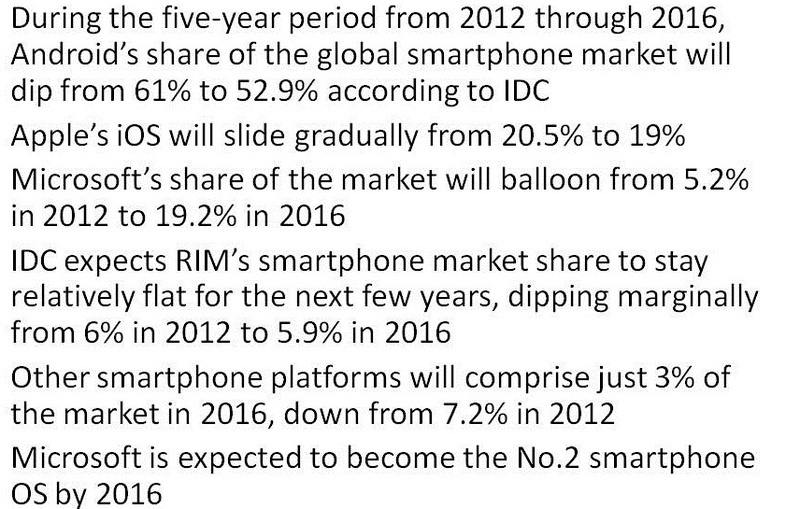 Analysts are already betting on the future prospect of Microsoft beating Apple to take No.2 spot in smartphones by 2015 and Microsoft beating Android to take No.2 spot in tablets segment. Interestingly here, the device evolution that Microsoft has followed is contrary to the Apple evolution. Both Microsoft and Apple followed their strengths in respective fields – Microsoft in computing and Apple in Mobility. So while Apple’s design was seeded in the iPod Touch which evolved into iPhone which then evolved into iPad (Touch being the cornerstone customer experience), Microsoft’s journey was from the Desktop computer which evolved into laptops and netbooks which then went the ultrabook way and finally manifests itself in the Surface with a keyboard. 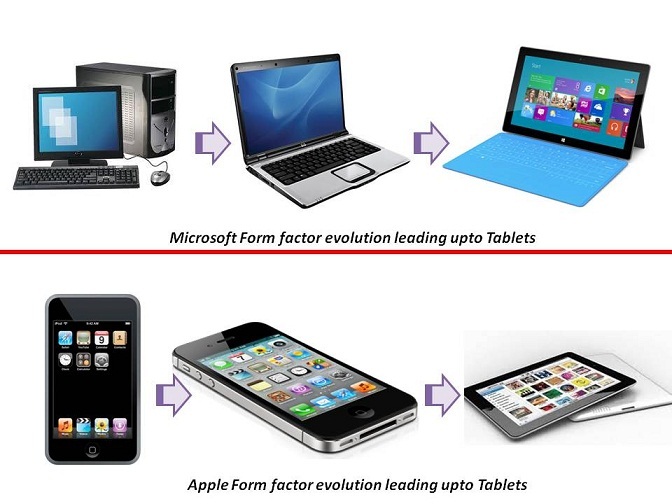 This is an interesting study of how different form factor and devices have evolved into the converged device category of the future- Tablets. Android’s weakness may be Windows’s gain. Even as ComScore reported four straight months of Android smartphone growth slowdown in 2012 (Jan- April) in US markets, the one device that Android has failed to lord over globally is tablets – it remains Android’s Achilles heal. Amazon was a single quarter flash in the pan and it remains to be seen how Amazon leverages its content comptence to lift up its delivery device- Tablet sales. 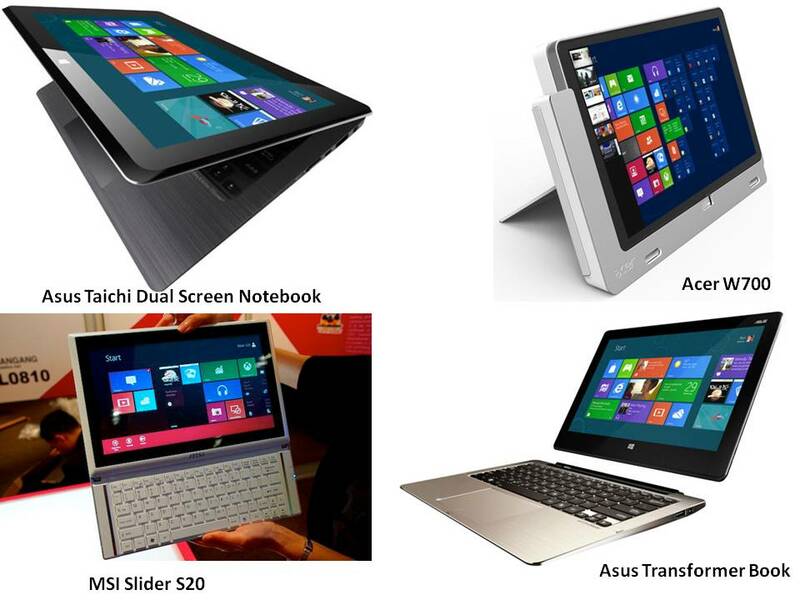 Now with Windows8 tablets making their first appearance – it is expected that Windows8 will usher in the new wave of Microsoft devices – tablets and ultrabooks with the keyboard dock and touch functionality. Morgan Stanley has predicted that after Apple and their iPad, Microsoft will take the number two spot in the tablet market, in the process surpassing Android. Morgan Stanley now estimates shipments of 133 million tablets in 2012, up 57% from their original estimates; and 216 million tablets in 2013, up 112%. No surprise there, tablet sales have been growing fast — despite high-profile stumbles by Hewlett-Packard and Dell — thanks to demand for Apple’s iPad. 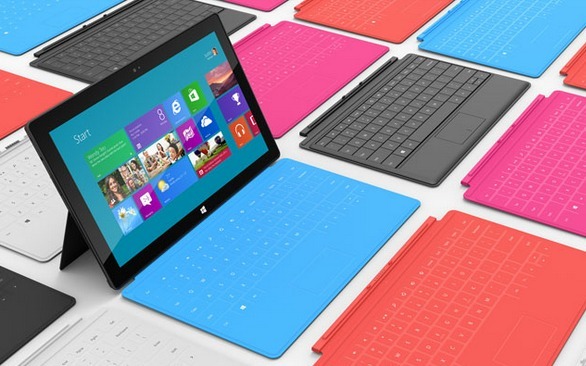 The report expects 25% of (new) users expect to buy Windows 8 tablet. Office will be the key feature, especially for those considering their first tablet purchase. Microsoft would be able to attract tablet builders by bundling its two strongest personal computer brands — Office and Windows. Microsoft’s hopes are pinned on the success of the tablet – if Microsoft can’t make itself relevant in the tablet market now, the value of its Windows and Office brands will only get weaker over time as Apple and Google push alternatives to Office such as Apple’s iWork and Google Docs on iOS and Android tablets. For Microsoft, it’s now or never. End of road for Sony? Technology companies keep a lot of cash and investments for a reason, to tide them over in bad times, and to fuel turnaround strategies. When the cash starts to run out, however, that’s a clear sign that we’re no longer talking about a turnaround. A headline that caught my eyes today, was that Sony shares had breached the 1000 yen level in Nikkei. This was the first time after 1984 (28 yrs) that Sony has seen such a valuation. Worse, Sony now has less cash than a quarter’s sales. Compare that with Microsoft which could get by for three quarters on its cash, if sales fell to zero. Or Cisco, which could live for a year on its cash and short-term investments. Kazuo Hirai’s turnaround plan for Sony has yet to show any results whatsoever. There is a point in the life of every technology company’s lifecycle where you go from turnaround mode to survival mode. At that point it’s usually too late to do much of anything. The next best option is then to sell the non-core assets of the holdings and draw money to support core operations.